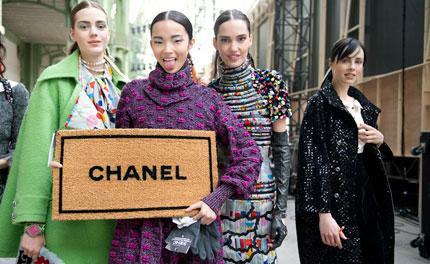 On the morning of 4 March, Paris' Grand Palais was transformed into a giant shopping centre, where a maze of aisles set up under its towering glass and steel domes featured Chanel shopping carts and shelves stocked with all manner of Chanel branded merchandise. It was Karl Lagerfeld's latest fashion show for Chanel and it was, in two words, a Total Blockbuster. From legs of real Jambon Cambon and stalls stuffed with huge wheels of cheese and crates of fresh vegetables, to Chanel branded olive oil, chocolate bars, cotton balls, bouillon cubes and even hard hats, the product assortment was endless. It was as if Monoprix had cross-pollinated with Target and Dean & DeLuca, and out popped a billion SKUs of practically-minded meets fantasy-riddled product, all of which was bundled up in a glossy consumerist package that only Lagerfeld can effectively manage. The clothes got much of the same democratic treatment. Chanel's famous quilted handbags, for instance, got wrapped up in cling film as if they were pieces of meat from the butcher, while model's carried wire baskets that were trimmed in leather and silver metal braiding, bringing new meaning to the handbag industry term 'The Shopper'. Many of the clothes looked terrific this season, especially the Lurex-shot boucle knits that were cut into sculpted-waist short dresses with bell sleeves, or in mini skirts with swing jackets. Every single look, whether it was a pair of knit pants spiked with neon, a brocade skirt suit or a fabulous geometric circle printed dress, was paired with a sporty pair of Chanel rubber-soled trainers, some in sassy knee-length versions and others blazing with flashy iridescent swirls. These were, after all, clothes to go to the supermarket in. So the Chanel girls comfortably took a spin through the double C aisles of the Grand Palais doing what they do best: shopping.